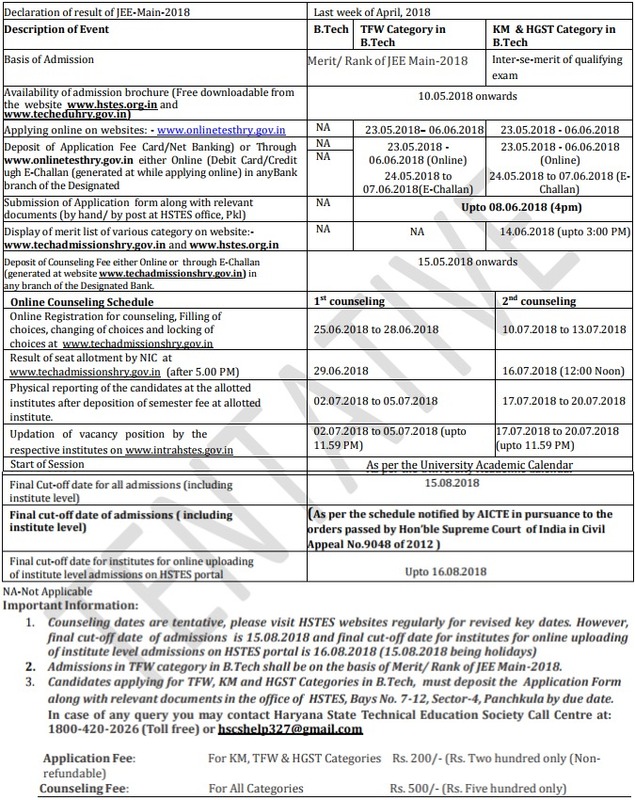 Haryana B.E / B.Tech Admission 2018 – Department of Technical Education, Haryana has released schedule notification from eligible candidates to admission in B.E / B.Tech Courses for the academic year 2018-19. 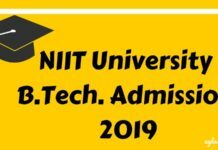 Admissions for B.E/B.Tech shall be made on the basis of the inter-se-merit of JEE (Main) 2018 through online off-campus counseling by NIC. Candidates can check the complete information of Haryana B.E / B.Tech Admission 2018 application process, eligibility criteria, and other information through this page below. Latest: Updates regarding counselling of Haryana B.E / B.Tech Admission 2018 has released. Candidates can check the same from below. Candidates who are eligible will be selected on the basis of Merit / Rank secured in JEE (Main) 2018 examination. Candidates will get all the details related to Haryana B.E / B.Tech Admission here. Schedule for the Haryana B.E / B.Tech Admission 2018 is given below. The qualified and eligible candidates will informed to attend the counselling for admission into B.E / B.Tech courses for the academic year 2018-19 as per the schedule. Candidates can check the updates regarding counselling of BE/B.Tech from the link provided below. B.Arch. : 2nd Online Counseling Result is available from 5 PM on 20/07/2018. B.E./B.Tech. (Lateral Entry): 2nd Online Counseling Result is available from 5 PM on 19/07/2018. B.Arch. : 2nd Online Counseling starts from 11 AM on 17/07/2018. B.E./B.Tech. : 2nd Online Counseling Result is available from 5:30 PM on 16/07/2018. B.E./B.Tech. (Lateral Entry): 2nd Online Counseling starts from 10 AM on 16/07/2018. B.Arch. : 1st Online Counseling Result is available from 6:30 PM on 10/07/2018. B.E./B.Tech. : 2nd Online Counseling starts from 10 AM on 10/07/2018. Diploma (Engg. ): 2nd Online Counseling Result is available on the website. Diploma (Pharmacy): 2nd Online Counseling Result is available from 5 PM on 06/07/2018. B.Arch. : 1st Online Counseling starts from 11 AM on 06/07/2018. Diploma (Engg. ): 2nd Online Counseling starts from 9 AM on 04/07/2018. Diploma Engg. (Lateral Entry) : 2nd Online Counseling Result is available from 6 PM on 03/07/2018. Diploma (Pharmacy) : 2nd Online Counseling starts from 10 AM on 02/07/2018. B.E./B.Tech. : 1st Online Counseling Result is available from 5 PM on 29/06/2018. Diploma Engg. (Lateral Entry): 2nd Online Counseling starts from 10 AM on 29/06/2018. Diploma (Engg. ): 1st Online Counseling Result is available from 5 PM on 27/06/2018. Diploma (Pharmacy): 1st Online Counseling Result is available from 5 PM on 26/06/2018. B.E./B.Tech. : 1st Online Counseling starts from 10 AM on 25/06/2018. B.E./B.Tech. (Lateral Entry): 1st Online Counseling Result is available from 5:15 PM on 22/06/2018. Diploma (Engg. ): 1st Online Counseling starts from 10 AM on 22/06/2018. Diploma (Pharmacy): 1st Online Counseling starts from 10 AM on 21/06/2018. Diploma (Engg.) : Payment of counseling fee of Rs.500 (non-refundable) through website starts from 10 AM on 21/06/2018. Last date for Submission of B.Arch Form in the office of HSTES has been extended upto 03/07/2018. Check the Key Dates. Diploma (Pharmacy): Payment of counseling fee of Rs.500 (non-refundable) through website starts from 11 AM on 20/06/2018. Diploma Engg. (Lateral Entry): 1st Online Counseling Result is available from 5 PM on 19/06/2018. B.E./B.Tech. (Lateral Entry): 1st Online Counseling shall start from 10 AM on 18/06/2018. B.E./B.Tech. (Lateral Entry): Payment of counseling fee of Rs.500 (non-refundable) through website starts from 10 AM on 15/06/2018. Department of Technical Education, Haryana has released the merit for BE/B.Tech BioTech Kashmiri Migrant on the official website. Candidates can check the merit from the official website i.e. ww.hstes.org.in or through the direct link which is provided below for the sake of candidates. Result: Click here to check Merit list of BE/B.Tech BioTech Kashmiri Migrant. by the candidate for any correspondence with HSTES, Panchkula. The direct link to fill the Application Form will also be provided here for the sake of candidates. After completion and submitting all the details like personal detail, educational details, course details candidates are advised take printout of their submitted application form and deposit the same in the office of HSTES, Bays No. 7-12, Sector-4, Panchkula before the closing date along with the attested copies of relevant documents and proof of fee deposition. Application fee: Rs. 200/- for KM, TFW & HGST Category. The Application Fee once paid shall not be refunded (full or partial) under any circumstances. The service charges will be charged from the payer for using the online payment gateway. Obtained at least 45% marks (42.75% in case of candidate belonging to SC category) in the above subjects taken together for B.E/B.Tech and B.E/B.Tech. (Bio-Technology) respectively. If there is any change in minimum academic qualification in terms of percentage in aggregate for the private institute for the session 2018-19, it will be incorporated at the time of counseling. Basis of admission for B.E./B.Tech: The Basis of admission for B.E./B.Tech is inter-se-merit of combined merit of JEE Main-2018 conducted by CBSE, New Delhi. Basis of admission for B.E./B.Tech (Bio-Technology): Admission during centralized counseling shall be made on the basis of the inter-se-merit of JEE-MAIN-2018. Remaining unfilled/ vacant seats of centralized counseling shall be filled by the institute, firstly by the candidates who have studied only Biology and thus could not take the JEE-MAIN exam. Inter-se-merit for such candidates shall be calculated on the basis of marks of Physics, Biology, Chemistry/ Bio-Tech/ Computer Science. 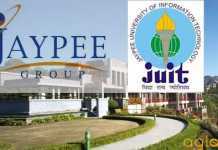 50% Seats in UIET, Maharishi Dayanand University, Rohtak and 50% Seats in UIET, Kurukshetra University, Kurukshetra of their intake in B.Tech (Bio-Technology) course shall be filled by the candidates who have studied only Biology and thus could not take the the JEE-MAIN exam. Inter-se-merit for such candidates shall be calculated on the basis of marks of Physics, Biology, Chemistry/BioTech/ Computer Science. These seats may be filled by the respective Universities parallel to online counseling for B.Tech course. Kashmiri Migrants (KM), Haryana Govt. School Topper (HGST) and Tuition Fee Waiver (TFW) Quota seats in B.E/ B.Tech courses: Minimum Academic Qualifications shall be same as mentioned above. (A) Kashmiri Migrants seats (5% of the sanctioned intake of each course) for B.E./B.Tech. will be supernumerary seats and will be filled separately on the basis of inter-se-merit of the qualifying examination. The percentage shall be calculated on the basis of Marks of Maths, Physics, English and any one of the following (whichever is highest): Chemistry/Bio-Technology/Biology/Technical Vocational subject. Kashmiri Migrants will be required to have the original certificate of Migration duly signed by the competent authority or Relief commissioner. The candidates who have secured higher marks in Mathematics shall rank higher in order of merit. If tie still persists, the candidates who have secured higher marks in Physics shall rank higher in order of merit. If tie still persists, the candidates who have secured higher marks in Chemistry/Bio- Tech/Computer Sc. / Biology (as the case may be) shall rank higher in order of merit. If tie still persists, the candidate who is senior in age shall rank higher in order of merit. If there is a tie even after that, all such candidates would be given the same rank. However, if they all wish to take admission in the same institution and there is only one seat left, and then additional seats would be created for that year only to provide admission to the same rank holders. The candidates who have secured higher marks in Physics shall rank higher in order of merit. If tie still persists, the candidates who have secured higher marks in Chemistry shall rank higher in order of merit. If tie still persists, the candidates who have secured higher marks in Biology/Bio-Tech (as the case may be) shall rank higher in order of merit. If there is a tie even after that, all such candidates would be given the same rank. However, if they all wish to take admission in same institution and there is only one seat left, and then additional seats would be created for that year only to provide admission to the same rank holders. The candidates applying under Kashmiri Migrants (K.M.) will produce a certificate in the support of their claim from the competent authority or Relief commissioner. Candidate if any simultaneously applying for all options i.e. through JEE (MAIN)-2018 for B.E/B.Tech 2018 as well as under Kashmiri Migrants (KM) Quota are required to apply separately and deposit the separate counseling fee i.e. Rs.500/- (non-refundable) , through www.techadmissinshry.gov.in for submitting separate Application Forms at HSTES office. 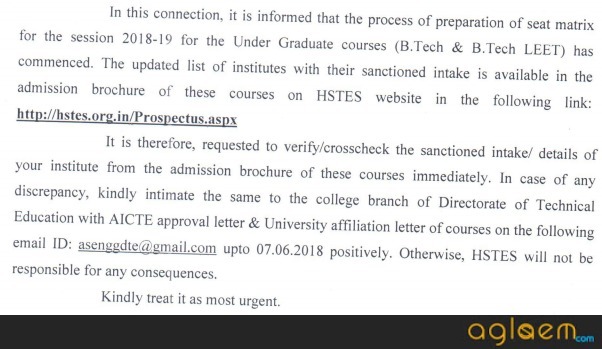 After the display of merit list, candidate has to participate in Online Off-campus counseling on website www.techadmissionshry.gov.in , separately for each category. (B) Haryana Govt. School Topper (HGST), seats in each branch in the Govt./Aided/University Department/Private Institutes offering B.E./B.Tech Programme shall be filled on the basis of inter se merit of 10+2 (of 2018 only) out of each topper (having Minimum 2nd Div . i.e. 50% marks in aggregate) of Govt. Senior Secondary School offering Science Stream (Having Minimum 5 students on roll in the Science stream), subject to fulfilling the eligibility criteria. The candidates shall produce a certificate in the support of their claim from the Principal/Headmaster of the Govt. School of which the candidate is topper clearly stating the strength of the class. The candidate should have minimum 2nd Div. i.e. 50% marks in aggregate, in qualifying exam. The Govt. Senior Secondary School offering Science Stream should have minimum 5 students on roll in their Science stream. The percentage shall be calculated on the basis of Total Marks of Maths, Physics, English and Chemistry. The candidates shall produce a certificate in support of their claim issued by the Principal/Headmaster of the Govt. School from where the candidate has passed his qualifying exam and the candidate is topper of his school, clearly mentioning the strength of the school in Science stream. The candidates who have secured higher percentage marks in the 3 subjects i.e. Mathematics, Physics and Chemistry shall rank higher in order of merit. If tie still persists, the candidates who have secured higher percentage marks in the 2 subjects i.e Mathematics and Physics shall rank higher in order of merit. If tie still persists, the candidates who have secured higher marks in Mathematics shall rank higher in order of merit. If tie still persists, the candidates who are senior in age shall rank higher in order of merit. If there is a tie even after that, all such candidates would be given the same rank. However, if they all (after 1, 2, 3 & 4) wish to take admission in the same institution and there eat left, and then additional seats would be created for that year only to provide admission to the same rank holders. However, if they all wish to take admission in the same institution and there is only one seat left, and then additional seats would be created for that year only to provide admission to the same rank holders. Note: Only toppers of Govt. Senior Secondary School offering Science Stream of 2018 are eligible. Seat reserved for HGST is within the sanctioned intake. Certificate from the Principal/of the Govt. 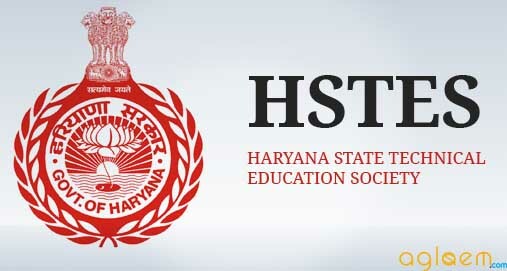 School of Haryana of which the candidate is Topper, clearly stating the strength of class and the candidate claiming HGST quota should be Topper (minimum 2nd division) in current year exam (i.e.- 2018). (Minimum strength of class should be 5 to become eligible for HGST) as given. Attested copy of DMC of qualifying examination and Matriculation Certifaicat. Only those candidates whose parental / Guardians annual income from all scources is less than 6.00 lacs can apply for TFW category by producing income certificate by the competent authority or refer Affidavit of income on stamp paper from Notary. Attested copy of Aadhar Card (enrolment no. in case Aadhar is not available). For more details about Haryana B.E / B.Tech Admission 2018 – Download Information Brochure.